📍 26th of November, Luang Prabang. 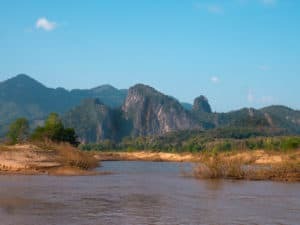 One of the very few things we knew about Laos is that it was a rather small and underdeveloped country, that it had amazing waterfalls in Luang Prabang and a delicious chili shrimp paste. Since we were already in the north of Thailand, continuing our journey in Laos towards those waterfalls seemed like a logical next step. After a quick research we decided the best way of getting there was taking a bus to the border and then doing a two-day journey by boat. And boy, were we happy we went for this option instead of flying or taking a bus to Vientiane. We crossed the border with Thailand on the 24th of November, the day our visa was expiring. We loved our two months in Thailand and waited until the very last minute to leave the country to the approving amusement of Thai border guards. We got stamped out, got a Laos visa and in the evening were already getting acquainted with a new country. 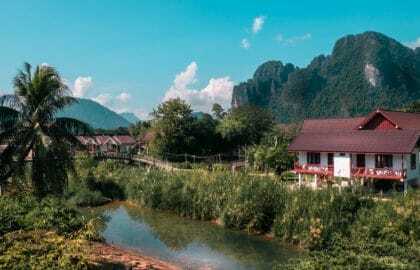 You can’t call Huay Xai an extraordinary town. It is very small and not very rich, most of the shops and restaurants grouped on one main street thus creating a town centre. And yet there is something charming about it. Maybe it was the warm afternoon sun on the elegant balconies or maybe the town’s provincial flair. 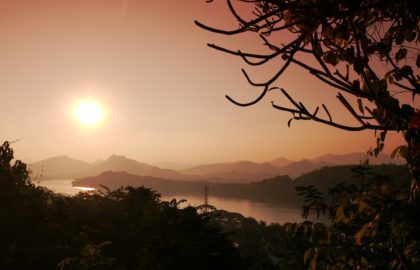 We really enjoyed our little stroll and a cold Beerlao watching sunset over the scenic Mekong river. Surprisingly, the beer was also much cheaper and tasted much better than Chang in Thailand. We knew we were off to a great start in Laos. 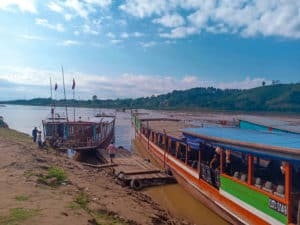 “Are you taking a slow boat or a fast boat?” – a question all travellers ask each other with a little smirk when someone announces their plan to go down the Mekong river to Luang Prabang. The fast boat is an infamous option with a notorious safety reputation and extremely loud engine which gets you to the destination in just one day instead of two. We never seriously considered it, and once we saw people in old helmets crammed on a tiny boat speeding through the rapids, we just shook our heads and with a smile whispering “craaaaaazy”. Apparently, another cool thing about this boat is that you hear noise in your ears for days after the journey. Lovely. Slow boat tickets are sold virtually anywhere. The official (no mark-up) price is 220 000 LAK (apx. 22 EUR) for the entire journey (Huay Xai – Pak Beng – Luang Prabang). Having checked the prices around, we got our ticket for 230 thousand LAK at the guesthouse. We were happy to pay a bit extra and not waste time hunting for the cheapest option (presumably directly at the pier 2 km away). The ticket also included a morning transfer to the prier, so we felt it was a fair deal. Although there are seat numbers written on the ticket, they are absolutely meaningless. Seat allocation works on the principle “First come – first served”, like most other public transport in Southeast Asia. Not sure why they even bother writing seat numbers, maybe just to make sure they don’t overbooked the boat 😉 What this approach means is that if you want to get a seat further away from the noisy engine, you must get to the pier as early as possible. Our transfer got us to the boat at 09:40 AM – almost two hours before the departure. We got first row seats (and surprisingly our actual assigned seat numbers) and had plenty of time to get ourselves water and yummy tuna sandwiches for the boat ride. Shorty after organized tour buses started to arrive to the pier reminding us yet again not to ever get on one of those. Flawless as it went, we do have one regret from that morning. It is not getting more of those delicious sandwiches. The boat ride was great. Surprising comfort came from the seats which are recycled from minibuses and are pretty comfortable, even after six hours of sitting. What a genius idea! Soon after leaving the pier we got to know a couple of lovely people around us. Light small talk in-between of listening to audio books (Darja finally got Eat Pray Love) and getting some work done, all while appreciating the bright blue sky over the green hills and the mountains fading the in background. Beautiful. One of the best views are at the back of the boat, behind the engine, where all the smokers congregate. You can really enjoy the gorgeous scenery and take some great pictures if you can stand the smoke. Probably not the most pleasant place to be if you are not addicted to nicotine. Of course, this is also one of the two party locations on the boat where tourists and locals alike drink beers and engage in lively conversations. The first and main pub-like area is at the very front of the boat where the seats are aligned to the walls instead of being put in rows. After a couple of hours on the boat the crowd split into three groups: the party people, the sleeping people and the something in-between people. The latter group constituted by far the majority and spent most of their time chatting, playing games, reading, observing the nature or the party people while maybe having a beer or two. The party people group was naturally the loudest and the most entertaining to watch. Some tensions arose when the party people got too close to the sleeping people or too eager to drag some in-betweeners to the dark side, but it was all resolved without any drama 😀 If by now you’ve concluded that the party people group was mostly young men in their twenties, let us disappoint you, this is no stereotypical party boat. The average age was probably way over 35 with an even gender distribution. Fun. We arrived at Pak Beng around 6 PM, shortly after sunset and were welcomed by a crowd of people trying to sell us anything from accommodation to magic mushroom shakes. They should consider packaging those 😀 Despite recommendations we were given on the boat to book one of the “safe and clean” rooms they offered, we decided to try our luck with getting a good walk-in rate. Sylvie, the Belgium girl sitting in front of us included us in the little social slow boat group she had created with fellow travellers around us. The moment after we could disembark, she was already rushing to the nearest guesthouse negotiating a group rate. This worked well, and we got ourselves a decent double room for almost a third of the lowest price we saw on booking.com. Yey! To be fair, there was probably no need to rush – there are seemingly way more rooms than people arriving to the village. 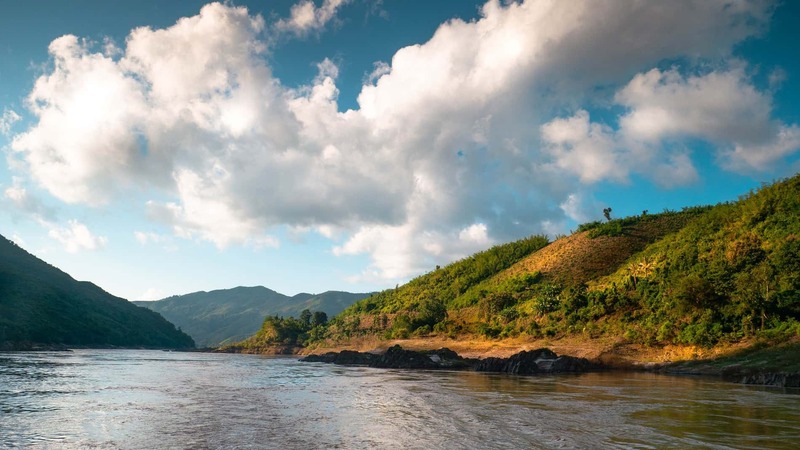 The sole purpose of existence of Pak Beng seems to be to cater for people traveling to or from Luang Prabang by boat. The main road is exclusively guesthouses, restaurants and bars fighting for the newly arrived visitors. Most people get in, check in, grab a dinner and a maybe a couple of drinks and leave the following morning. We did exactly the same. We had a surprisingly nice Indian (don't ask why) dinner with our slow-boat group at Hasan restaurant. Since it was still rather early and we were all in the mood for chatting, we followed our waiter to the Hive Bar further in the village. It was a fun, yet rather short night with a couple of shots of Lao rice whiskey and a cocktail. Way before Cinderella's curfew we all retired to our beds. 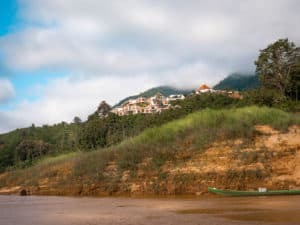 Later we found out you could extend your stay in the village and do some nature trekking or enjoy the views from the pool of the fancy Le Grand Pakbeng. Something to consider if we are ever to come back here. Since we didn’t have much time in Laos, we continued our trip to Luang Prabang the following morning. Just across the street from our guesthouse was a little café serving early morning breakfast. After we reserved our seats on the boat, our little slow boat club reunited for some coffee and eggs. We also made sure to get enough sandwiches for the way, although regrettably these were not as good as the ones back in Huay Xai. Muffins and pain au chocolat, on the other hand, not only looked exactly like home but also tasted like it. Mmm, the smell of fresh pastries. So. happy. At 9 AM the journey continued. The only thing which made us cringe was how everyone jumped to their feet and were taking pictures of children every time we stopped at a village to drop off some locals. It felt like we were on some kind of safari. This was so rude and so disrespectful. Can just imagine what kind of image these kids form of us, tourists – daily boats coming with drunk red-faced white people holding a beer in one hand while zooming in on the kids with another. Yikes. The rest of the day was beautiful and uneventful. The views continued to be amazing, the party people surprisingly continued partying although it all mellowed down a bit, the sun continued shining (but today we remembered to apply some sunscreen). Overall, it was a very chilled experience. 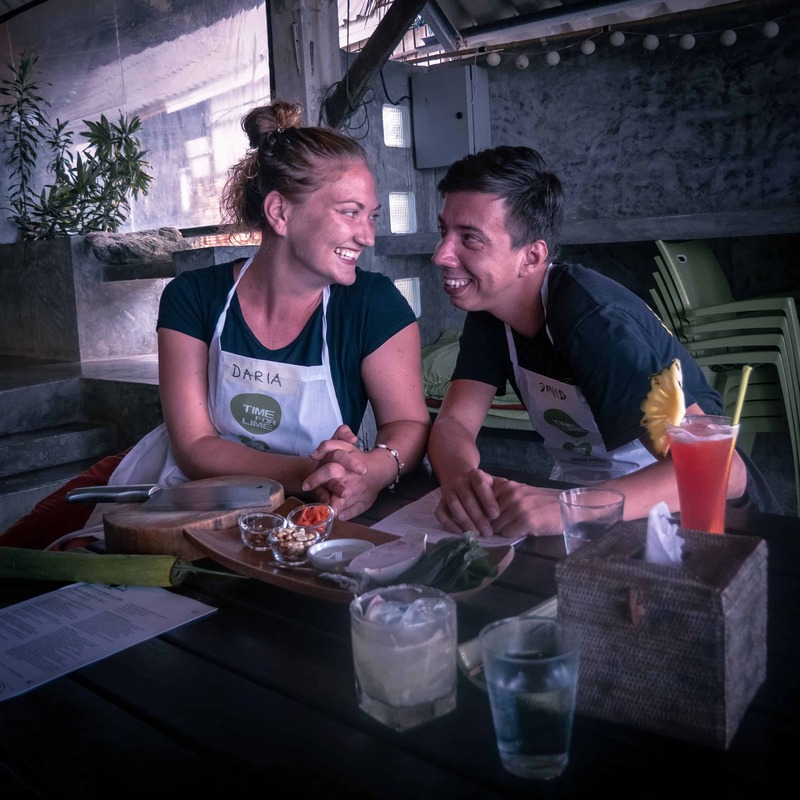 This centrally located hostel is a fantastic option if you don’t mind staying in the dorm – the rooms are small, but very clean. There is a terrace with the reception in front, so there is always somebody chilling there, ready to start a chat over a beer or coffee. Breakfast was a la carte, coming in generous portions and with an additional plate of fruits. You really couldn’t ask for more, especially for 34k LAK per night. Overall, for 12 days in Laos we have spent 6'861'500 LAK or ca. 686 EUR. This resulted in 571'792 LAK (= 58.5 EUR / 67 USD / 95 AUD) daily average. 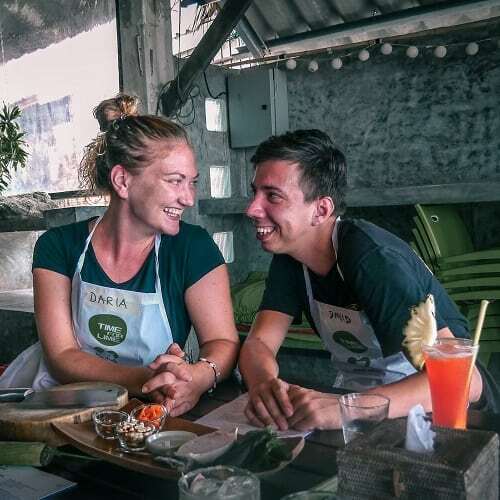 We were aiming to spend about 15% less than that, but the delicious food in Laos, especially all those pastries distracted us from the goal 🙈 Read our detailed Laos budget breakdown in this post. Want to learn how we set our travel budget and (most of the time) reach our budget goals? Read our detailed guide about travel budgeting, including tips on how to safe some money while on the road. WOW. What a beautiful, comprehensive post! I felt like I was there and read every word. Thank you so much for taking the time and care to document this experience. I’d heard about the slow boat vs fast boat experience from travellers while I was in Bali and “Some tensions arose when the party people got too close to the sleeping people” made me literally laugh out loud. Hee hee. I’m impressed you found good pastries and I agree -it is rude when tourists take photos of locals like they are taking pics of animals in a zoo or on safari. I’m glad you pointed that out. Maybe it will make some re-consider. The photos are lovely. Now I want to go. I want to go everywhere it seems. What a nice read.